Demand side policies are important during a recession or period of economic stagnation. Supply side policies are relevant for improving the long run growth in productivity. 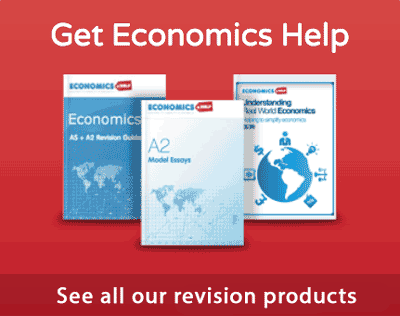 Demand side policies aim to increase aggregate demand (AD). This needs to be done during a recession or a period of below trend growth. If there is spare capacity (negative output gap) then demand side policies can play a role in increasing the rate of economic growth. 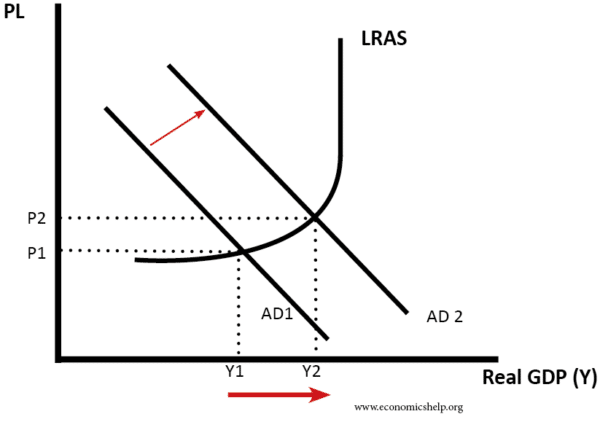 However, if the economy is already close to full capacity (trend rate of growth) a further increase in AD will mainly cause inflation. In this case, the economy at Y1 has spare capacity. 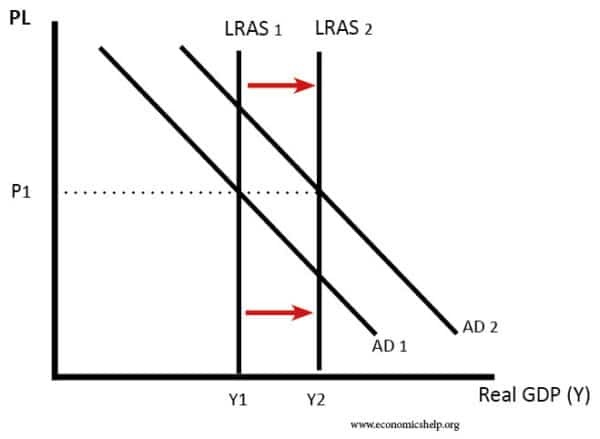 Therefore an increase in AD leads to a rise in real GDP. 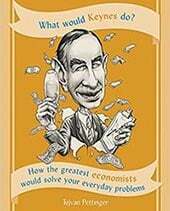 Monetary policy is the most common tool for influencing economic activity. To boost AD, the Central Bank (or government) can cut interest rates. Lower interest rates reduce the cost of borrowing, encouraging investment and consumer spending. Lower interest rates also reduce the incentive to save, making spending more attractive instead. Lower interest rates will also reduce mortgage interest payments, increasing disposable income for consumers. 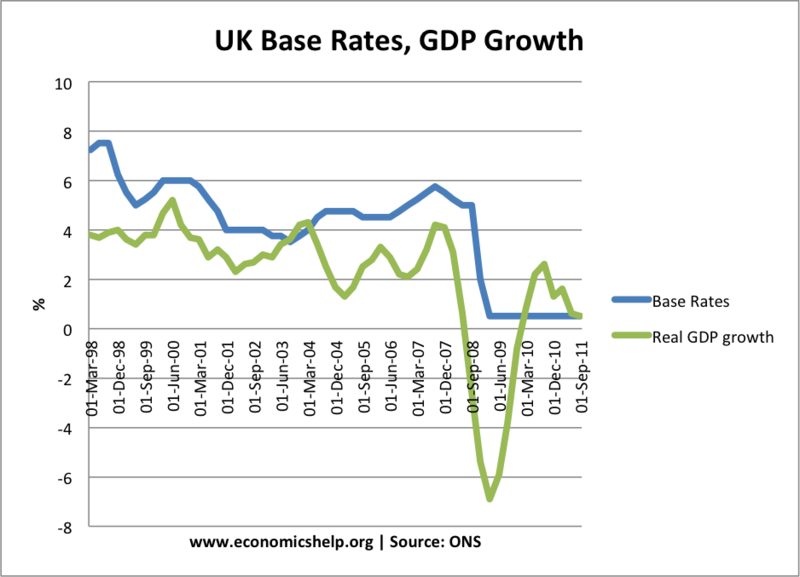 In 2009, base rates were cut to 0.5% to try and stimulate economic growth in the UK. More detail on the effect of lower interest rates. Another criticism of monetary policy is that cutting interest rates very low could distort future economic activity. For example, the US cut interest rates following the economic uncertainty of 9/11. These low-interest rates encouraged people to take on ambitious loans and mortgages; this was a factor behind the US housing bubble. Therefore cutting interest rates, at the wrong time, can contribute to a future housing and asset bubble which will destabilise economic growth. However, in 2009-12, the depth of the financial crisis means there is no immediate danger of a housing bubble, so it was appropriate to keep interest rates at zero. In a liquidity trap, where lower interest rates fail to boost demand, the Central Bank may need to pursue more unconventional types of monetary policy. Quantitative easing involves increasing the money supply and buying bonds to keep bond rates low. The hope is that the increase in the money supply and lower interest rates will boost investment and economic activity. The fear is that increasing the money supply could cause inflation. Though evidence from 2009-12 suggests that the inflationary impact was minimal. Without quantitative easing, the recession was likely to be deeper, though QE alone failed to return the economy back to a normal growth projection. The government can boost demand by cutting tax and increasing government spending. Lower income tax will increase disposable income and encourage consumer spending. Higher government spending will create jobs and provide an economic stimulus. The problem with expansionary fiscal policy is that it leads to an increase in government borrowing. To finance this extra spending, the government have to borrow from the private sector. 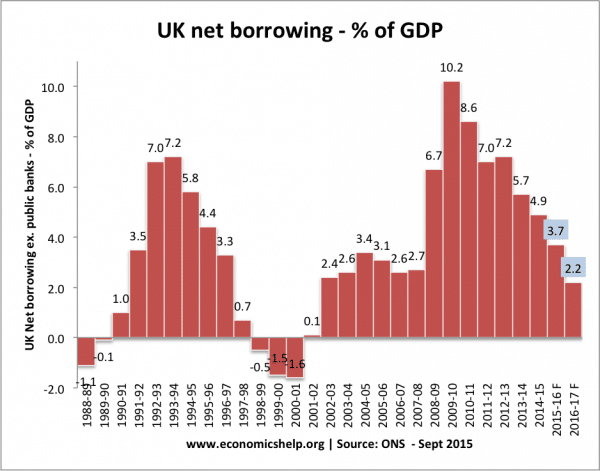 If the economy is already growing, then higher government borrowing can crowd out the private sector. Expansionary fiscal policy is also criticised by those who fear it is an excuse to permanently increase the size of the government sector. However, if the economy sees a rapid fall in private spending, and rise in the saving ratio, expansionary fiscal policy can help provide a boost to demand in the economy without causing crowding out. The aim of expansionary fiscal policy is for the government to offset the fall in private sector spending. Similarly, during a period of economic expansion, the government may need to do the opposite of higher taxes and lower spending to create a budget surplus. For countries stuck in a fixed exchange rate. Devaluation can help restore competitiveness and boost domestic demand. A fall in the exchange rate makes exports cheaper and imports more expensive. For example, Argentina and Iceland both had rapid devaluations, which in the medium term helped their economic recovery. The UK also benefited from leaving the exchange rate mechanism in 1992. The disadvantage of devaluation is that it can lead to short-term economic pain. Rising import prices increase inflation and reduce standards of living. Devaluation is also seen as a sign of economic and political weakness. 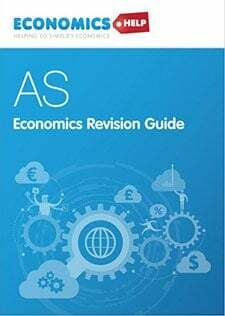 In the case of Eurozone countries, devaluation is needed (see: competitiveness in Europe), but it is much harder to devalue and leave the exchange rate because of the likelihood of capital flight. Demand side policies cannot increase the rate of growth above the long run trend rate without causing unsustainable boom and bust. For example, in 1972, the UK chancellor, Anthony Barber announced a ‘dash for growth’. Taxes were cut against a backdrop of rising house prices and inflation. This led to the Barber boom – rapid economic growth. However, it also caused a spike in inflation, and the growth proved unsustainable. In the 1980s, there was a repeat boom and bust. In the late 1980s, there was a loosening of monetary and fiscal policy. 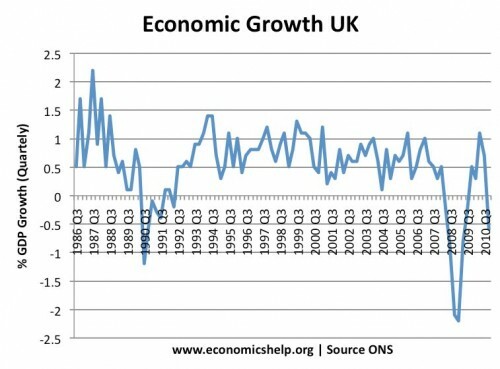 This led to very high growth and inflation; this growth proved unsustainable, leading to the recession of 1991-92. In some cases, demand side policies need to be used to limit the growth of aggregate demand. 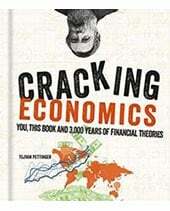 It is necessary to avoid an economic boom, where growth proves unsustainable and inflationary. Managing AD to avoid boom and bust cycles can help provide a longer period of economic expansion. The alternative strategy for improving economic growth is to use supply side policies. These attempt to increase productivity and efficiency of the economy. Flexible labour markets. Highly regulated labour markets, with excessive regulation, may discourage firms from employing workers and setting up in the first place. It is argued that countries such as France have too much labour market restrictions, such as the cost of firing workers, maximum working week and minimum wages. More flexible labour markets can thus provide a long-term boost to investment. However, there is a trade-off. More flexible labour markets could increase job insecurity and lead to harmful effects on labour productivity. Better Union relationships. In the 1970s, the UK economy suffered because of poor industrial relations. There were frequent strikes which stopped production. With an adversarial attitude, it was difficult to promote more labour efficient production processes. Reducing the power of trades unions can help to improve labour productivity. Supply side policies can take considerable time. For example, if you invested in better education and training, it could take several years for this to lead to higher labour productivity. In a recession, supply side policies are not going to solve the fundamental problem of deficiency of aggregate demand. In a recession increasing the flexibility of labour markets and encouraging investment may help to some extent. But, unless there is sufficient demand, firms will be reluctant to increase production and set up new business ventures. For example, in how to deal with youth unemployment, the ECB president mentioned a ‘growth pact’. But, this growth pact is only considering supply side policies and not the lack of demand in countries with high unemployment. Politicians often over-estimate the potential for supply side policies to improve the long term growth rate. For example, in the 1980s, the UK pursued several relatively successful supply side policies (privatisation, reduce the power of unions, lower income tax). 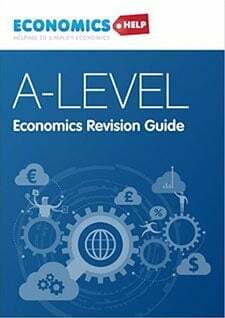 But, there was no economic miracle, when growth went above the long run trend rate of 2.5% – it proved unsustainable and led to boom and bust. More on supply side policies here.